This is what meteorologists at the National Weather Service in Brownsville want residents to remember as we approach the peak of the hurricane season, especially with the National Oceanic and Atmospheric Administration revising its 2017 Atlantic Hurricane Season outlook. On Wednesday, NOAA updated its outlook, and forecasters are now predicting a higher likelihood of an above-normal season. Forecasters now say there is a 60 percent chance of an above-normal season, compared to their May prediction of a 45 percent chance. They also increased the predicted number of named storms and major hurricanes. Wednesday’s updated forecast states there is a chance of 14-19 named storms, 5-6 hurricanes and 2-5 major hurricanes. Forecasters say the season has the potential to be extremely active and could be the most active since 2010. Local meteorologists want to remind residents that it only takes one hurricane to bring destruction to the area. “Yes, it’s slightly above normal and we could see more activity in the Atlantic basin this year, but the main point to get across is that it only takes one” hurricane to cause havoc, said Chris Birchfield, a meteorologist with the National Weather Service in Brownsville. Birchfield said that during hurricane season, residents should know if they live in a flood zone or evacuation zone, review their insurance policies, and have plenty of food, water and supplies on hand if they have to shelter in place. “We don’t want people to focus so much on the number of storms (being forecast), we’ve had systems affect our area in a below-normal year. Those people affected, it doesn’t matter whether it was a below-normal or above-normal year,” Birchfield said. The Atlantic basin already has seen six named storms this year: Arlene in April; Bret and Cindy in June; Don and Emily in July; and Franklin which became the first official hurricane of the season and was expected to make landfall Wednesday night in Mexico. Bell said other factors playing into an above-normal season include warmer waters in the Atlantic than models previously advised and higher predicted activity from available models. 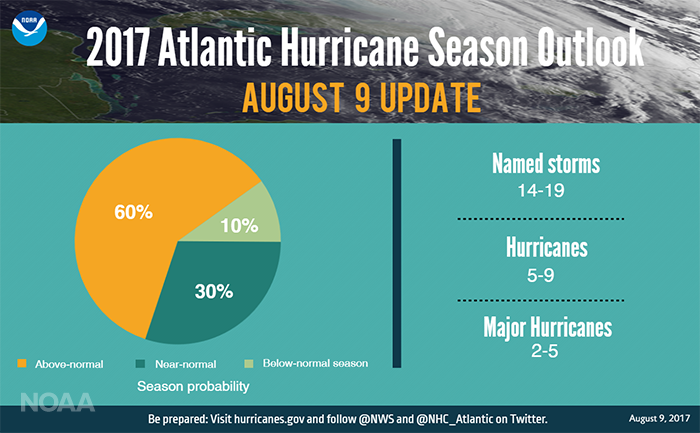 Officials say that during the first nine weeks of the hurricane season there have been six named storms, which is half the number of storms during an average six-month season and double the number of storms that would typically form by early August. 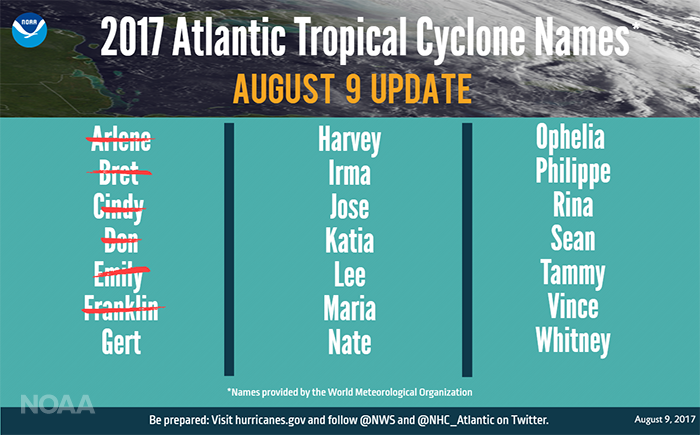 According to NOAA, an average Atlantic hurricane season produces 12 named storms, of which six become hurricanes, including three major hurricanes. Emergency management officials are reminding coastal residents to know their county’s evacuation plans, heed the warnings, update their insurance and have a preparedness plan. “(Wednesday’s) updated outlook underscores the need for everyone to know their true vulnerabilities to storms and storm surge,” FEMA Administrator Brock Long said.